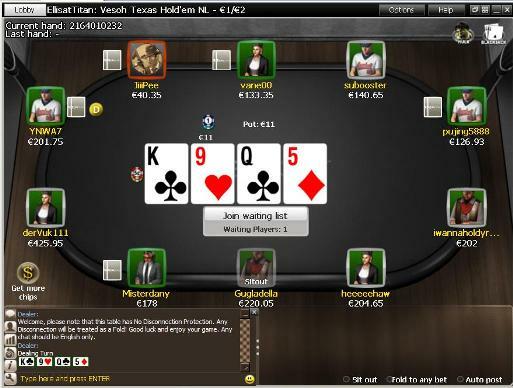 Titan Poker is a great poker site, known for tons of fish and award-winning support. Installing Titan Poker is done in two easy steps. 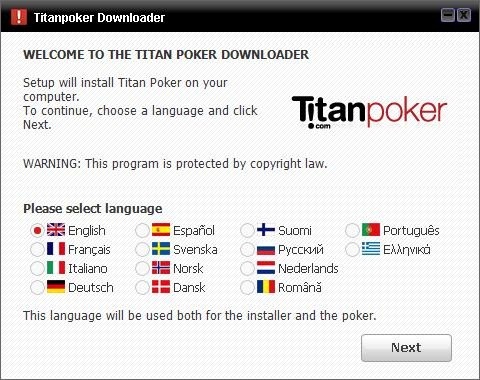 First, download a setup installer file (198KB) to your computer, which will then prompt which language you would like to install and fetches the necessary files to install Titanpoker in your selected language. This may take awhile, depending on your connection speed. The approximate total Titan Poker download size is around 60 MB. Once you have downloaded the software, you just need to set up an account by clicking on the \”Create Account\” button. Afterward, the actual setup begins. Titanpoker’s installation setup is straightforward and it doesn\’t take long after the download to get signed up and running. Features of the Titanpoker software include mini-table and full-screen view, four color deck, live support, player notes, buddy list, hand history replay tool, and more. Titanpoker offers monthly promotions, including a bad beat and top hand of the day bonus, and a VIP club where you can exchange points for cash. A Titan Poker Download gives you access to not only a poker room but also to a sportsbook, bingo parlor, and casino. If you feel like placing a wager simply head on over to Titanbet. Feel like playing some Blackjack? The casino is just a click away. You can transfer your funds between the different platforms with just a click of a button! If you\’re having any trouble with the installation, do not hesitate to contact Titan Poker’s support since it’s superb. For three years straight starting in 2006 Titanpoker’s customer service won Gambling Online Magazine\’s Best Online Poker Customer Service Award. Not only is the support prompt in responses, they also have live chat support (within the poker client) for instant feedback! Titanpoker’s website is available in 14 languages. To change the display language, simply click on the desired language’s flag. The software and support runs in 17 different languages: English, Polish, Swedish, French, Italian, Norwegian, German, Danish, Russian, Romanian, Spanish, Finnish, Dutch, Czech, Greek, Hungarian and Portuguese. Titanpoker does not currently offer its services to American players, so if you\’re located in the United States the Titanpoker Download will not be available. There is an online Mac flash version, but none for Linux. Windows users must have Windows 98 or higher. 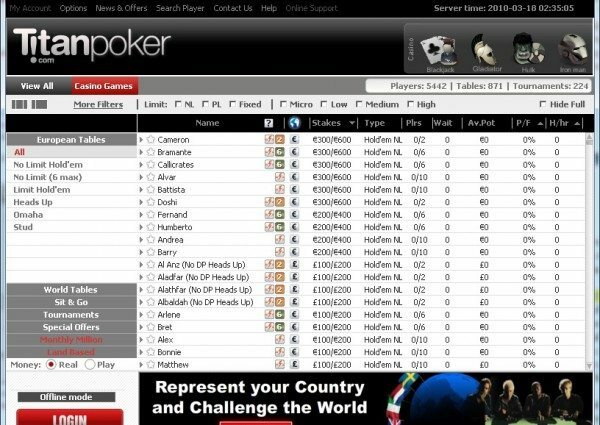 The Titanpoker download is without a doubt the most notable and well-known iPoker site. It is one of the best sites around, on the fastest rising network, so it comes as no surprise that they have great software that is easy to get around and looks great. They feature the common collapsible system on the left side of the screen. At the top and bottom of the interface, you\’ll find the current promotions going on, which means you don’t need to do any work to find those promotions. The interface is very smooth, and looks quite professional. Titanpoker is one of the online industry\’s leading fully supported poker Card Rooms. To demonstrate their transparency, there is a unique built-in game and financial history feature available in their software. They are licensed by the Kahnawake Gaming Commission, which ensures the games are fair and winners are paid. Their software is also tested by TST Technical Systems Testing. With great game selection at all limits and great security and support, try downloading Titan Poker today!